Modern 2-seater "cuddler" Sofa In "botanic" Fabric, treated with ScotchGuard and fitted with Easiglide coasters, no stains or marks, cost over £400 2 Years Ago and hardly used. 2 matching cushions in plain green velvet included free. Sit back and instant rexlaxation in this Arther Corner Sofa deeply padded cushions and super soft Cord fabric finish. Foam seating and fibre back/Arm Cushions. Fibre Back/Arm Cushions. Faux Leather finisting Details. Cream Leather Effect Sofas. 2 Seater used. Cream Leather Effect Sofas. 2 Seater used.. Condition is Used, but good, slight scratches too leather. On wooden square feet. Lovely 3 seater chaise sofa bed in Genuine good quality White Leather from DFS similar to John Lewis and Furniture Village. Uncouples into 2 sections for easy transport. BARGAIN!! 3 Seater Sofa & 2 Chairs!! S3 seater sofa & 2 chairs. Real Leather Ex-Dfs 3 Seater Sofa & 2 Chairs, Buttoned Back Modern Design, RRP £2049. These sofas have regularly been cleaned and protected with leather clean and seal. Genuine leather sofa set. Good condition with minor defects ( not visible). Good for both small sized rooms and large sized rooms. Looking for a quick sale. Preferably collection only however some delivery options available. This sofa show signs of wear in places which simply adds character. This sofa always keep the wow factor in any room. SOFA AND CHAIR £80. TWO SEATER SOFA £70. SOFA AND 2x CHAIRS £85. SINGLE CHAIR £60. This is a used real leather sofa. Bought from DFS several years ago as part of a suite. It’s in very good condition as it was used the least out of the suite of chairs that I bought. No obvious cuts, scratches or stains on the main seating area, arms or headrests, although there is a dent at the back where it was pressing against something. This does not detract from the condition of the sofa. It’s a two-seater but could potentially hold three people. Buyer collects from North London. Payment via PayPal or cash on collection only. Measures 170cm across the back of the sofa. This is a beautiful sofa in pristine condition as we bought as a sofa for the spare room but realised. (Corner sofa for sale due to house move. very big sofa :)! 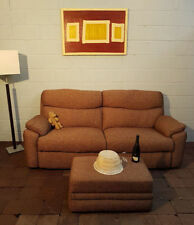 Large DFS corner couch and footstool. GREY Combination Colour. This sofa show signs of wear in places which simply adds character. This sofa always keep the wow factor in any. SOFA AND CHAIR £80. TWO SEATER SOFA £70. SOFA AND 2x CHAIRS £85. SINGLE CHAIR £60. We often replace fittings and fixtures for broken feet or wheels. Bought from: DFS. These sofas are still on DFS website so you can check all the details there. 4 Seater Curved Manual Double Recliner. Material: 100% leather. 2 Seater Cream Leather Sofa and Arm Chair. Condition is Used. Dispatched with Royal Mail 2nd Class. Lovely Sofa, used very good. Pick up only in Leicester and cash on collection. Brought from DFS. However, price has been reduced for quick clearance. 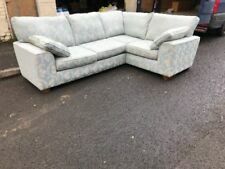 This sofa set is for COLLECTION ONLY from Walsall (UK) to avoid hassle from our end.